The price of a barrel of Brent crude has more than halved over the past five years, triggering an existential crisis for the world’s biggest oil producers. It’s also forced the withdrawal of billions of petrodollars that have been circulating throughout the global economy while providing a windfall to consumers in the form of lower energy costs. The slide has come amid a great clash between the historically dominant OPEC members — now attempting to support prices with a global production-cut deal and scrambling to diversify their economies — and upstart shale producers in the U.S., which have slashed costs, improved their efficiency and refinanced vast loads of debt in a drive to survive. Two recent pieces of research highlight the challenges for the world’s top energy exporters, exposing higher “break-even” prices for crude than commonly estimated. Make no mistake, OPEC members enjoy some of the cheapest crude production on simple accounting terms. In a note published late last month, Goldman Sachs Group Inc. analysts led by Michele Della Vigna estimate that new projects in places like Saudi Arabia, Iraq and Iran can generate profits with oil prices at just $20 to $40 per barrel — not far from the current price of around $48.20. Despite enormous strides in technology and cost-cutting, U.S. shale by contrast still requires about $50 to $55 per barrel to make the bulk of its projects profitable, according to Goldman’s estimates. Profitability is just one way to slice an oil producer’s needs, however. Another looks at the fiscal break-even price — or the magic figure at which oil producers can balance their budgets. 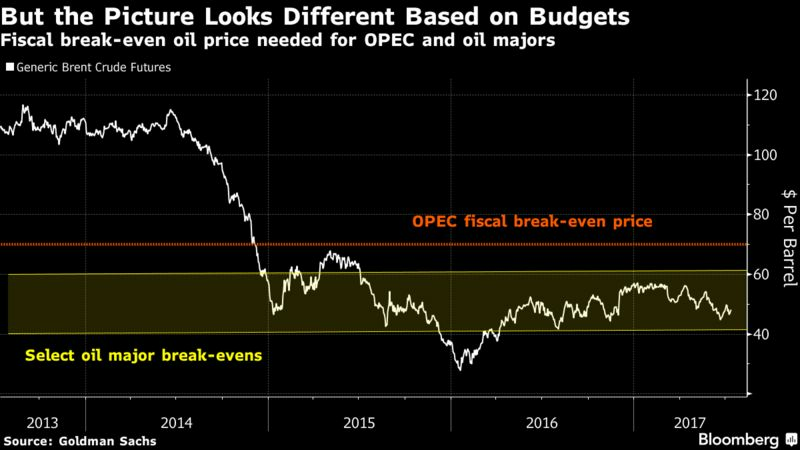 On this basis, OPEC producers require an estimated $70 per barrel this year, higher than the $40 to $60 required by listed energy companies to fund capital expenditure and dividends, Goldman says. It’s a reversal of a historic trend. Between 2011 to 2014, when oil prices ranged between $57.33 to $126.65 a barrel, OPEC producers enjoyed a cost advantage of $10 to $40 per barrel over listed ‘Big Oil’ firms, according to Goldman’s analysis. A third measure paints a similar picture of a dramatic shift. New research by Brad Setser and Cole Frank at the Council on Foreign Relations, an independent research group, suggests that energy-watchers look at ‘external break-evens,’ or the oil prices needed by producers to foot their often-significant import bills. Using external break-evens takes into account currency moves that may have implications for national budgets, and makes it easier to form comparisons across countries. Since oil is priced in U.S. dollars, cheaper crude could, for instance, be partially offset by a devalued domestic currency — as was the case with Russia and the rubble. “An external break-even price below the global oil price thus indicates a potential for either additional fiscal spending or currency appreciation; a break-even price above the global oil price indicates an underlying pressure for budget cuts or depreciation, at least in the absence of substantial buffers of reserves or borrowing capacity,” Setser and Frank say. The average external break-even for oil and gas exporters was only $20 to $30 per barrel before the bull market in crude, which saw Brent hit an all-time high of almost $147.50 a barrel in mid-2008. The break-even then surged during the boom period as imports climbed, to $80 in 2014. As oil prices crashed, the external break-even also came down, to $55 in 2016, driven by a “brutal fall in imports,” according to the paper. The average external break-even masks significant variations between oil exporters, however, with Libya at one end of the spectrum requiring $140 a barrel and Norway needing just $20. While the research shows some forced adjustment to the era of lower oil prices, it also hints at more pain to come by pouring cold water over the optimism surrounding oil producers’ attempts to diversify their economies.